St. Louis, MO - Now, it's fast and easy to meet elevator disconnect requirements with the Cooper Bussmann Quik-Spec Power Module Quik-Ship Program. With only three-business-day shipment, the Cooper Bussmann Quik-Ship program offers five of the most popular, fully-loaded models of the Cooper Bussmann Quik-Spec Power Module. 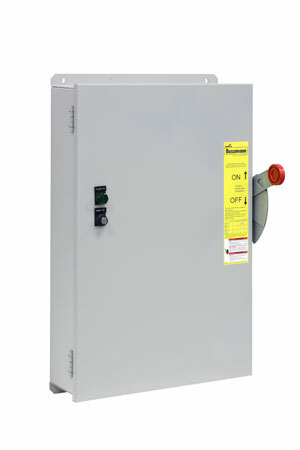 This all-in-one solution for elevator disconnect requirements provides shunt-trip capability, selective coordination and fire safety signal interface, and is UL98 Listed for a 200kA short-circuit current rating. "As a proven leader in Code Compliance and Downtime Reduction products and services, the Quik-Ship Program is another example of how Cooper Bussmann helps customers and specifiers meet tight schedules," said Kevin Hug, Cooper Bussmann senior product manager. "The all-in-one elevator disconnect Quik-Spec Power Module was introduced by Cooper Bussmann to help contractors meet complex Code requirements. Now, with our new Quik-Ship program we can offer the fastest and most efficient solution for getting elevator disconnect requirements taken care of." Ordering the Quik-Spec Power Module is incredibly easy. Factory configuration only requires the relevant electrical and circuit information. Installing the Quik-Spec Power Module is fast and easy. The module is shipped as a complete unit only requiring mounting and attachment of electrical leads. Additionally, the Quik-Spec Power Module has Cooper Bussmann Low-Peak Class J fuses, making it selectively coordinated when using a 2:1 lineside-to-loadside fuse ratio with any other Cooper Bussmann Low-Peak fuse. The Quik-Spec Power Module meets all prevailing ANSI/ASME, NEC and NFPA 72 requirements in the UL98 Listed (enclosed switch) and UL50 Listed (enclosure) units.